Hotel Pegas Brno is located in the very centre of town beneath Brno's Špilberk Castle, in the immediate vicinity of an important Gothic monument (Saint James's Church) and Brno's central square (Námestí Svobody) - map. 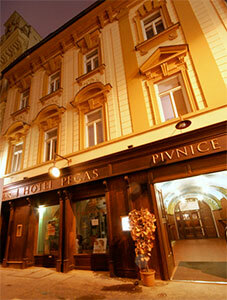 All the historical sights of the City of Brno can be reached extremely easily on foot from Hotel Pegas. Hotel Brno Pegas is located in a building whose origins stretch back to the 14th century, evidence of which is provided by a number of archaeological finds made during reconstruction of the building. The hotel has recently undergone complete restoration, thanks to which Hotel Pegas Brno now provides accommodation of four-star standard in comfortably furnished, air-conditioned single, double and triple rooms. One of the remarkable features of the hotel is the fact that a small brewery is located in the basement, with beer being brewed right in front of the guests in the restaurant. This was the first small brewery to be built in Moravia and the second in the Czech Lands after the legendary U Flekù brewery in Prague. In terms of the volume of production it is presently the largest small brewery in the Czech Republic. You can find out more on our pages devoted to the brewery. You can see and order hotel rooms on the hotel pages, and find today's menu on the pages of the hotel's pub. We welcome your comments and suggestions at "Write to us". Pegas - hotel, pivovar, pivnice, s.r.o.